The good thing is that more and more people are now beginning to realize that Barack Obama is leading their country off a cliff into an economic fiasco that we will likely never recover from; the bad news is that it may already bee too late. Right now, we’ve got “czars” appointed by Obama that are running roughshod over entire industries with absolutely no congressional or people’s oversight whatsoever. There are now FIFTEEN “czars” accountable to no one but Obama: a drug czar; an energy and environment czar; a health czar; an urban affairs czar; an economic czar; a regulatory czar; a technology czar; a government performance czar; a border czar, a WMD policy czar; an intelligence czar; a car czar; a Great Lakes czar; a Stimulus czar; and now a Cyber czar. Again, Czars dominating industrustries and whole sections of the massive government infastructure who are accountable to no one but the president. We have seen the tactic used by this administration over and over again — find or create a crisis, then violate the people’s liberties to deal with it. We saw it with the banking industry. We saw it with the mortgage industry. We’re seeing it with the auto industry and the energy industry, the global warming hoax, and many others. This is a president who wants the federal government to control everything of any significance. Controlling the Internet would be most helpful to him in forcing his Marxist agenda down the throats of the American citizens. [By the way, even as Obama plunges the economy of the nation into ruin by pursuing the radical global warming agenda, a new NASA study confirms that – surprise – the sun, NOT man, has been responsible for warming. Not that the obvious facts have ever mattered to liberals]. If you don’t think what Obama is doing is Marxism, as Dieckmann (and recently the Russian Pravda) describes it, try fascism. Or insert your own blatantly un-American “-ism” (examples: totalitarianism, socialism). Call it whatever you want: it’s an insult to everything America stands for. Maybe Hugo Chavez and Fidel Castro think it’s a joke; I don’t think there’s anything funny about it. I don’t think there’s anything funny about Obama’s using czars answerable only to him to shred the Constitution to set aside firmly established bankruptcy and contract law in order to make a political payoff to his union constituency. Has gone on public record as being scared of his work capabilities already in his appointment in the auto task force. THIS is the guy who “finds himself dismantling General Motors and rewriting the rules of American capitalism” (in the exact words of the New York Times)? How do we not deserve to go the way of the Dodo bird when we do crap like this? Liberals who used to decry Bush for his imperial tactics are an insult unto themselves; Bush’s “abuses of power” are to Obama’s what a pea-shooter is to a hydrogen bomb. Obama is continuing the things that liberals have screamed the most about (including domestic eavesdropping which he once opposed; including the right to use enhanced interrogation methods should he deem it appropriate; including the use of rendition to send terrorist suspects to countries that will employ harsh interrogations; including the use of military commissions he himself condemned; including the right to hold people indefinitely without trial that he previously had demonized. The ONLY difference between Bush and Obama on these issues is that Bush wasn’t a pompous, self-righteous, arrogant liar and demagogue, as Obama has now proven himself to be. Meanwhile, on top of all the “abuses of power” liberals attacked Bush over, Obama has further taken it upon himself to abuse federal power like no one before him had ever even dreamed. Bush opened the door to this crap; Barrack Hussein has essentially driven a suicide-bomber’s truck right through that door – and is in the process of driving his bomb into the very heart of our economy, our infrastructure, and our entire way of life. And more and more people are FINALLY starting to become angrier and angrier about it. Not enough to stop it. But enough to give one hope that we’re not as insane as it has previously appeared. The Rasmussen Reports daily Presidential Tracking Poll for Friday shows that 34% of the nation’s voters now Strongly Approve of the way that Barack Obama is performing his role as President. 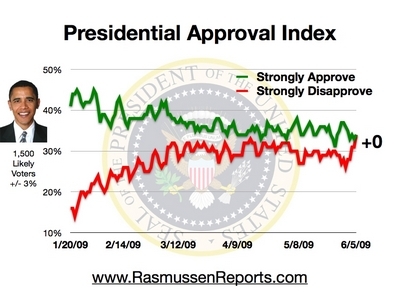 Thirty-four percent (34%) Strongly Disapprove giving Obama a Presidential Approval Index rating of 0. That’s the highest level of strong disapproval and the lowest overall rating yet recorded (see trends). The President’s ratings have slipped since General Motors filed for bankruptcy to initiate a new government bailout and takeover. Just 26% of Americans believe the GM bailout was a good idea and nearly as many support a boycott of GM products. It remains to be seen whether the dip in the President’s numbers is a temporary reaction to recent news or something more substantive. The Presidential Approval Index is calculated by subtracting the number who Strongly Disapprove from the number who Strongly Approve. It is updated daily at 9:30 a.m. Eastern (sign up for free daily e-mail update). Updates also available on Twitter. Obama’s approval can only go down so far no matter what he does or how badly he fails. If he were to so destroy the United States to such an extent that it became like North Korea – a people’s socialist utopia that has so little economic production that it’s people are in a constant state of famine, having so little energy it might as well be in the dark ages – I truly believe that 45% of Americans would still vote to re-elect him in 2012. And with most of the mainstream media still continuing to sing his praises just as the North Korean media continues to fawn over their “Dear Leader” Kim Jong-Il. It may literally be too late to save this country from impending economic collapse. Already $1 out of every $6 in the US economy is coming from the government. And if Obama is able to nationalize our health care – and a further one-sixth of the economy – we will find ourselves in a position from which we will never be able to recover. History has proven that it is impossible to terminate federal bureaucracies once they have been created. Yikes! That’s a big dosage of economic cyanide the left wants America to swallow. If this whole agenda goes through, in 2009 the federal budget will run the budget deficit to $2.2 trillion — in a single year. That’s more borrowing in twelve months than the federal government did in 200 years! How do we possibly survive this crushing level of debt? “Economic cyanide,” indeed. Obama campaigned as this country’s “messiah” or savior. But who will be able to save us from Obama, once his ruinous policies explode?